When the first flight simulator was patented in 1929, it was a technological breakthrough. Never before had it been possible to safely train pilots in a variety of situations and conditions without ever leaving the ground. But while this invention was important, the original flight simulators would seem hopelessly old-fashioned to pilots today. Current professional simulators use data projectors to create a visual simulation on screens placed around an artificial cockpit. The user has a limited visual field and the realism of the simulation is dependent on a fixed object. Until now. Technological advancement has improved flight simulators exponentially. And now, with the use of high-resolution VR headsets like the XTAL from VRgineers, we’ve achieved the next level of flight simulator evolution. VR technology is an exciting opportunity for civil and military aviators because it allows for more immersive, realistic and versatile training simulations than ever before. New technologies like the high-resolution XTAL VR headset from VRgineers make it possible to replace the current cumbersome simulator setup. Embedding the XTAL headset into the flight helmet provides the highest level of immersion and the most realistic experience. Flight simulations become more portable and more affordable, since a 1:1 replica of the cockpit is no longer necessary. A simplified model with buttons and switches provides enough haptic feedback to dramatically increase the immersiveness of the experience. Switching from a screen to an advanced VR headset like the XTAL makes the flight simulator experience more immersive than ever before. One of the key components of the XTAL’s realistic VR experience is Leap Motion hand-tracking. This allows the user to see their own hands within the simulation visualization, resulting in unparalleled realism and usability for pilots including the ability to control the buttons and switches within the VR scene. To make the flight simulation as realistic as possible, VRgineers have combined virtual controllers and switches with real-world replicas, adding haptic feedback that makes the experience much more immersive for the pilot. But we won’t stop just with the hands. 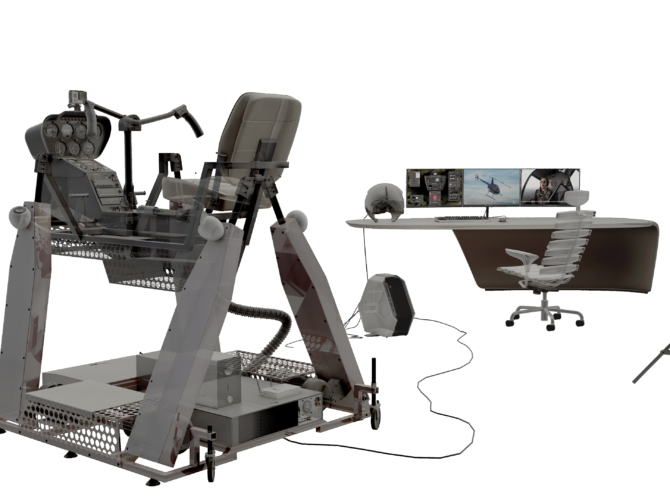 Together with Motion-sim, VRgineers are preparing a full concept simulator connected to a motion platform so professional military pilots experience perfect visuals as well as realistic force feedback. With a motion platform and a compact XTAL headset embedded in the flight helmet, along with controls from the selected airplane or helicopter, full rotation and a G-force of up to 2G’s are all intrinsic parts of the simulation. Flight simulators have never been more immersive and versatile! As VRgineers continue to develop new technologies and partnerships across the industry, the sky’s the limit for flight simulators! For more information about the full concept simulator and the high-resolution XTAL headset, please drop us a line at hello@vrgineers.com.